Description: This product, relatively new on the market, proved to be more effective than traditional cards, not only does it have a longer life, but they also produce a visual advantage in respect to the old cards. For your customers this product can bring a profit in addition to the activities they carry out. The making process is simple, consisting of printed cards listed applied on a magnetic foil sticker (which can be ordered from the internet). On international sites such magnetic cards are sold for about 0,5 euro/card. Conclusion: It is a product that can easily make it on the market, with important advantages on its side. Profits can be obtained with a very small investment. 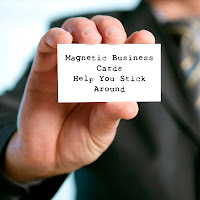 0 Response to "Magnetic business cards"